My mother’s updated version of her mother’s icebox cake recipe has always been a huge hit with my friends for the obvious reasons that it takes very little preparation and is super low in calories. Since summer is right around the corner and I am forced to emerge from my carb-coma for an impending bathing suit season, I thought I would share this recipe with all of you who have a sweet tooth, but a “sweet body” deadline. The “icebox” cake is an American food classic, originating in the 1930’s with the emergence of that little thing we now refer to as a refrigerator. Manufacturers would distribute pamphlets to show users how to make recipes using their “electronic iceboxes.” And so the icebox cake was born! 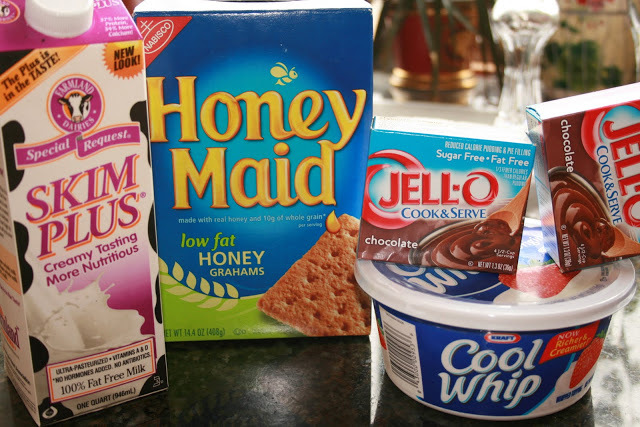 The definition of an “icebox” cake is any cake that uses the fridge as part of the preparation process, thus being served cold, instead of hot out of the oven. 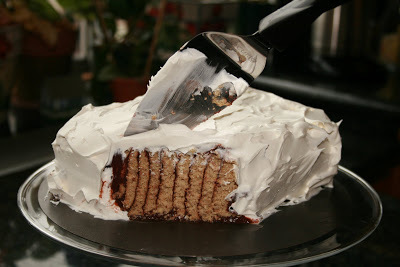 In the 1950’s the use of packaged foods soared, making the icebox cake a staple in all homes, including my mother’s. 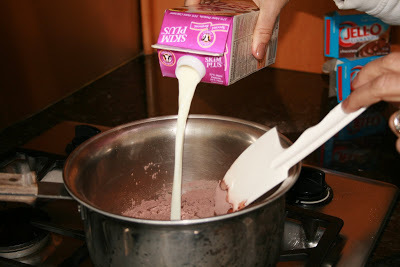 Below are instructions on how to make this delicious treat, and trust me, it does not take a skilled chef to figure this one out. 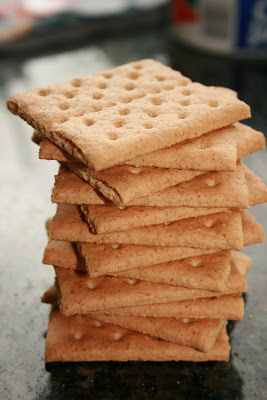 While the pudding is cooking, break your low-fat graham crackers in half so that they can be put in rows in your cake pan. 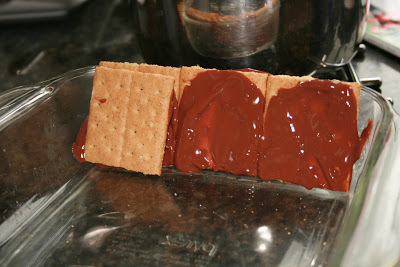 Then let the pudding cool just enough so you can slather it on one side of each cookie so they will stick together. Kind of like bricks and mortar. Once you have created all the rows with chocolate pudding in between each cookie, it should fill the pan and look like this. Put another layer of the remaining pudding all over the outside. 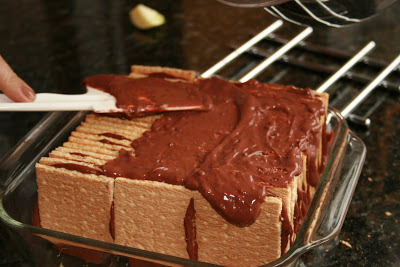 Then it’s time to cook your cake, and since it’s an icebox cake that means that you simply put it in the refrigerator. 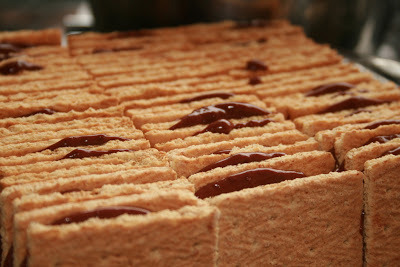 As it cools and soaks up all the flavor, the cookies will soften into a moist cake. 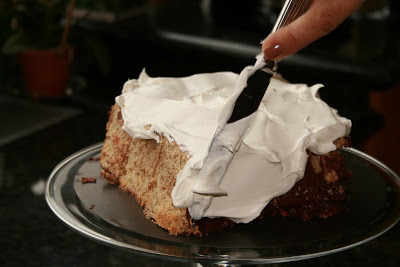 After it has cooled for a few hours, take it out and put on the cool-whip frosting! Cut the cake on a diagonal so that you don’t break apart the rows. When you cut it should look like nautical stripes, always room for fashion in cooking I say! Now it’s just time eat up guilt free and enjoy! Big thanks to my mother who taught me how to make this and helped me teach all of you!